International travellers arrive on the first day of the partial reinstatement of the Trump travel ban, temporarily barring travellers from six Muslim-majority nations from entering the US, at Los Angeles International Airport on 29 June 2017. Under a Supreme Court order, foreigners who do not have a “bona fide relationship” with a person or entity in the United States can be banned. The ban effects travellers from Iran, Libya, Somalia, Sudan, Syria and Yemen. Christians account for a steadily growing share of refugee arrivals in the US, Pew Research has found, although the net number of Christian arrivals may in fact be shrinking. 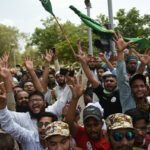 In its review of US State Department data, published on 12 July, Pew noticed a gradual increase in the numbers of Christian arrivals, at the same time as the number of Muslim arrivals is decreasing. Pew notes that the trend continued during the first five months of Donald Trump’s presidency, but says it is not necessarily a reflection of new policies, as many of the refugees to have arrived since Trump’s first day in office (21 January) would have applied months beforehand. Instead, Pew points to a general trend over the past 15 years, during which time Muslim refugees outnumbered Christian refugees only on three occasions – in 2005, 2006 and 2016. Pew also highlights the importance of taking into account the refugees’ country of origin, noting that since April – “when Christian refugees topped 50% of all refugee arrivals to the US” – of the six leading countries of origin, Iraq was the only Muslim-majority nation. Most refugees in that period came from the Democratic Republic of the Congo (which is 80% per cent Christian), while Ukraine and Eritrea were also in the top six. Previously, waves of Muslim refugees had arrived from countries like Somalia and Syria. Trump’s refugee policy has come under scrutiny from the very beginning, ever since his executive order banned immigration from seven Muslim-majority nations – including Somalia and Syria. Although that order was later stalled, a revised version (omitting Iraqi citizens) is now in force, ahead of a review later this year. There has been a predictably mixed reaction to Trump’s immigration policies. On the one hand, he and Vice President Mike Pence have been praised for speaking out on behalf of persecuted Christians. Yet on the other hand, some commentators have said that in seeking to prioritise refugees from persecuted faith groups, they are doing more harm than good. In January, Chaldean Patriarch Louis Raphael I Sako called Trump’s promises to Christians a “trap“. The Patriarch of the Chaldean Church, Louis Raphael I Sako, at an April 2015 mass in Erbil, the capital of the Kurdish autonomous region in northern Iraq, attended by Christians who’d fled the violence in the northern Iraqi city of Mosul. “Every reception policy that discriminates the persecuted and suffering on religious grounds ultimately harms the Christians of the East,” he said. The Patriarch said it gives credence to the propaganda that says Middle Eastern Christian communities are “supported and defended by Western powers”. He added that “these discriminating choices create and feed tensions with our Muslim fellow citizens. Those who seek help do not need to be divided according to religious labels. And we do not want privileges”. Meanwhile, Christianity Today pointed out that the net number of Christian refugee arrivals has actually shrunk – by about 14,000 – even if their share of the refugee population has increased, due to Trump’s lower overall limit of 50,000 refugee arrivals per year. Previously it was 85,000. “Over the past decade, more of those admitted to the US have been Christians than those of any other faith background, so the dramatic reduction in refugee arrivals this year means far fewer persecuted Christians will have the opportunity to rebuild their lives in safety in the US,” said World Relief’s President, Scott Arbeiter. One of the Christians’ lawyers said the US was “imposing a death penalty through the backdoor”.